As good of a game as Rogue Spear is, there are quite a few elements which drag the game down a few notches. The maps are passable, but the models are blocky (though well-animated). My biggest gripe concerns both the fonts and the overall presentation. The game is just plain confusing to navigate. Too little text in hard to read colors, poor screen layout for the menus, and a dumb controller interface makes getting into the game more of a chore than it needs to be. This hurts even more since this is a game where you really have to spend time with the planning menus to setup a decent action strategy. 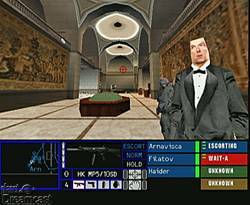 The screen is often way too cramped; Pipe Dream really should have redesigned the menus with televisions in mind. User-friendly this game is not. The game also has to reload each and every time a level is restarted, making you wish you could just nuke the stage at times and forgot about all those worthless, easily-shot hostages. The second problem I have is with the standard controller. While this is alleviated with the mouse and keyboard, it still bears mentioning. The control with the Dreamcast pad would be fine if it weren't for having to navigate through a stupid menu to input a command. Down left up left chu chu chu. It's just sad when it takes five button presses just to crouch. That's right. Don't even think of switching to another weapon while engaging an enemy... you'll be toast before you're halfway through the selection sequence. The controller configurations are also not displayed in the game, meaning you must remember the codename for the configuration best suited for you given in the manual. You must also select your control scheme each and every time you play a level since the game does not save that information, which is annoying as well. So both the presentation and control basically stink like dead trash. There's also that non-Internet enabled deathmatch mode. While the maps are quite interesting and the game keeps a nice framerate even with four split screens, the simple fact of the matter is that Rainbow Six cannot be played when other people can see your view. Rogue Spear is mostly centered around sniping and surprising the enemy, none of which is possible when you can glance at your opponents' screens. The splitscreen deathmatch runs pretty smoothly -- too bad seeing your opponent's view ruins the excitement. Given the one hit kills which are the nature of the series, death match basically becomes a stagnant battle of alternating deaths without any real sense of accomplishment or skill. Of course, if you're looking for a Dreamcast death match, then you probably already own Quake III Arena and are playing it right now instead of reading this review. My other big multiplayer gripe is the lack of cooperative play. Again, Rainbow Six is primarily a team-based cooperative game. Providing a death match option should have been an after though once the cooperative mode was put in, but, sadly, there just isn't any. 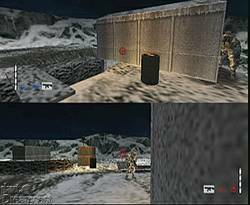 Even the Nintendo 64 version of Rainbow Six allows two players to run through a campaign together, so why can't the Dreamcast version offer a similar level of play? The omission is just disappointing. The graphics are also a bit disappointing. While the animation is top notch and adds to the realism, the character models and environments look like a Nintendo 64 game with better draw distance and (slightly) better framerate. The levels themselves look amazing in scope but are still lacking detail to make it look like anything but a set piece. Everything is flat with average but effective textures. It's not bad or anything, but certain games -- particularly Shenmue -- really cast a poor spotlight on the visuals of this aged PC port. Finally, I wish the game would randomly place the hostages throughout the building. This would lead to greater replay value. Once the game is over, it's over. Playing through the game with every tango position memorized just isn't as fun and thrilling as it is the first trip through. Also, if you don't know what "tango" is, don't reach for the manual since it helps explain the jargon about as well as it explains the game -- that is to say, poorly. Despite all of my nagging complaints, I still recommend Rogue Spear. If you've been looking for a Metal Gear Solid type game for the Dreamcast that doesn't feature chickens, this is as close as you're going to get. It's a brilliant, well-executed game with a few nagging shortcomings that keep it from reaching its true potential. Highs: Smooth (mouse, keyboard) control, strong AI, tension-filled gameplay, reduced loading times. Lows: Graphics are somewhat underwhelming overall, poorly designed menus, no online or cooperative play, using the regular DC controller is too unwieldy.